We have a great selection of quality wood futon frames to fit your taste and budget. With so many wood futons to choose from, you can be sure to find what you're looking for. We offer top brands you can trust made by manufacturers respected for their craftsmanship, reliability, and service. From sophisticated to simple, elegant to trendy, you are certain to find a wood futon frame that you will love. Browse our selection and choose one that fits best with your decor and design. Buy Today and Save with FREE Shipping! 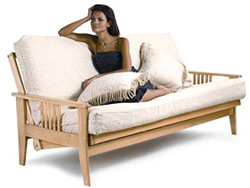 The two most compelling reasons to choose a wooden futon frame are quality and appearance. Wood futon frames are generally higher quality futons than metal frames. They last longer and are far more durable. If you are looking for a piece of furniture that will withstand lots of use and will last for years, a wood frame is the way to go. At Futon Creations we sell wood futon frames that will stand the test of time and use. A wood frame also conveys a completely different feeling than a metal frame. They are beautiful and stylish. They have the appearance of a sofa, though still boasting the flexibility of a futon. Our wooden futon frames come in shades from espresso to golden oak and can fit in with any decor. When deciding on what type of wooden futon frame to purchase there are several considerations. Take a long look the room it is going into. Do you want your frame to compliment the current feel of the room, or do you want to change it? Futon Creations has wood futon frames that range in style from clean and streamlined to warm and textured. We have natural wood shades including golden oak, cherry, dark cherry, maple, espresso and more. With so many high quality futon frames to choose from, you can find something to fit any look you can imagine. With Futon Creations, you never have to settle for anything less than a piece that is exactly what you need. And with our deeply discounted prices, you can afford to purchase a wood futon frame you will absolutely love. You also need to consider what will you will be using your wood futon frame for. If it is going to be in a guest room, you may want a frame with drawers for visitors to use. Some models have storage in the arms and beneath for rooms that have space issues. You might opt for a slimmer style if you are planning for it to be in a corner for occasional use. If it’s going to be the main piece in a living room, you may want to go for a frame with more bulk. A bunk bed style is great for a child’s room or a room that several people will be utilizing. Futon Creations also offer accessories such as grip pads that keep the futon mattress from slipping out of place when the wood futon frame is in the seated position. When purchasing your wood futon frame, don’t forget to check out Futon Creations’ amazing collection of futon mattresses, covers, pillows, bolsters and more. We have everything you need to build your perfect futon. You can always count on FutonCreations.com for the highest quality and the best value in the business.